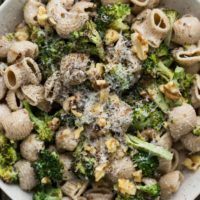 Roasted Broccoli Pasta with Roasted Garlic Goat Cheese Sauce | Naturally. As I start to balance our evening meals between what we would normally eat, versus what I should feed a toddler, I’ve started to find an intersection. 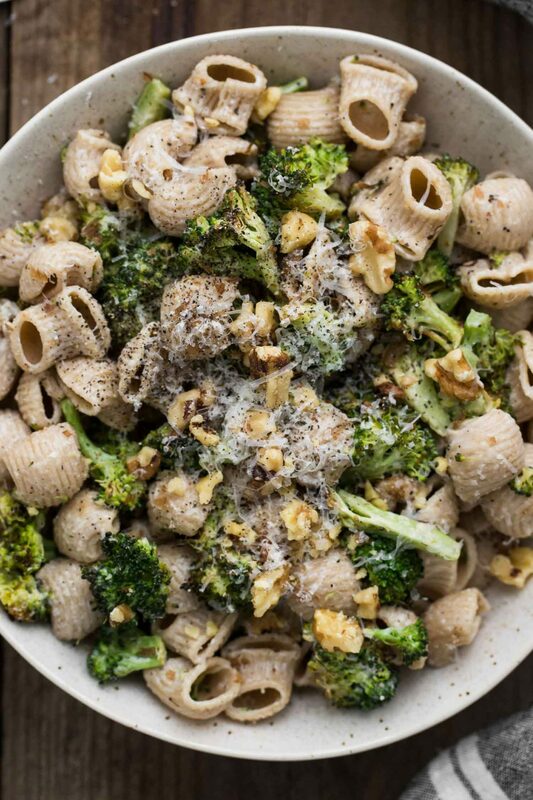 This roasted broccoli pasta is one of those landing spots (minus the nuts for him). You may look at me crazy about my toddler eating goat cheese (he does) but I love that I can easily minimize the salt in this recipe but still have good flavor, thanks to the roasted garlic. I roast a head of garlic weekly and store it in a bit of olive oil to use throughout the week. Beyond this pasta sauce, the roasted garlic is great on pizza, in other sauces, or added to hummus. 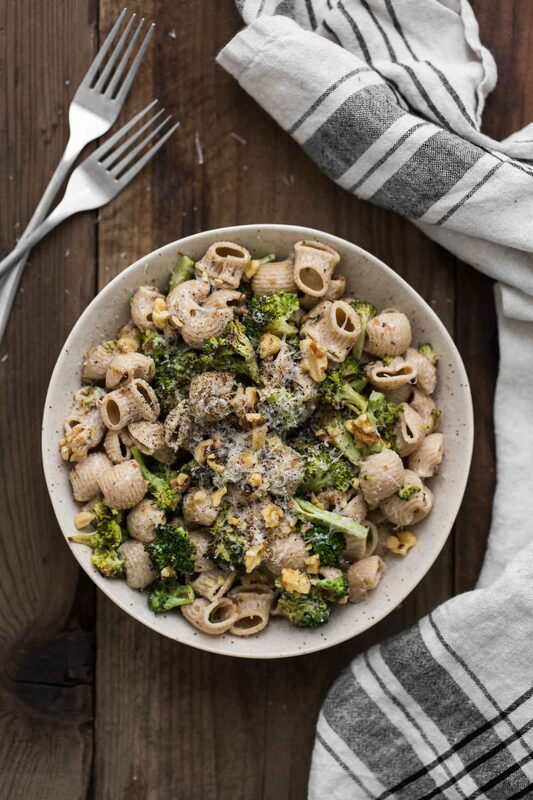 A hearty vegetarian pasta dish that uses an easy/creamy roasted garlic goat cheese sauce tossed with roasted broccoli and whole wheat pasta. Preheat oven to 375˚ F. Slice the top ¼” off a head of garlic. Drizzle with olive oil, wrap in parchment paper, and tie with cooking twine. Roast for 40 to 45 minutes until the garlic is soft and fragrant. 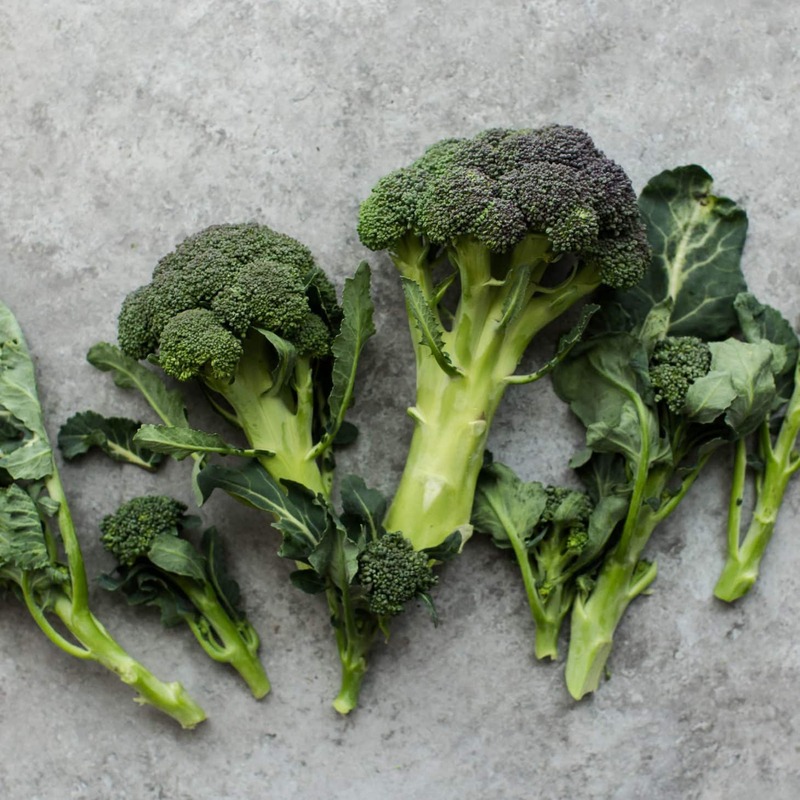 Cut the broccoli into bite-sized florets. Toss with olive oil and roast until tender and charring, 25 to 30 minutes. Prepare the pasta according to directions, drain and set aside. When the garlic is done, remove 5 to 6 cloves of the garlic. Combine the garlic cloves with the sauce ingredients in a blender. Puree until smooth. When broccoli is done, combine with the pasta, walnuts, and sauce. Serve immediately- the pasta will soak up the sauce fairly quickly! Tips and Tricks: If you’re not a fan of the pasta sauce soaking into the pasta, I recommend tossing a little reserved pasta water in with the sauce. This will help the noodles be a bit more saucy. We eat quite a bit of pasta and I’m always looking for ways to mix things up. While you can’t get this exact recipe to be vegan (although the vegan cheese on the market is getting better), there are a few good options. Mascarpone Cheese: If you’re not a goat cheese fan, pick up mascarpone cheese. It’s creamy, makes for a wonderful pasta sauce, and doesn’t have the goat flavor. Vegan: while this sauce isn’t as easy the goat cheese sauce, I love this lemon-almond pasta sauce. You could also do a cashew or sunflower cream sauce. Cauliflower: replace the broccoli with roasted cauliflower. Super tasty! Sadly, I bought the walnuts but forgot to put them in. It was still good without them. This pasta sounds wonderful, and is definitely something I want to make. I’m always glad to hear when toddlers are willing to eat things like goat cheese. We have two grandsons who are incredibly picky eaters and two who are willing to try just about anything. The older of the two adventurous ones really likes a lot of stuff that most people would consider weird for an 8-year-old to like. Children who like different foods are a lot easier to deal with. 4 oz. will not serve “two large” in this house. Why cook 4 oz. of pasta? I will use a whole pound, eat at least half and save the rest for leftovers. For reference, I am tall but lean, 6’6″ 210 lbs. Recipe looks great – thanks for posting! Oh goodness, this recipe looks delicious! I’d love to make it today, but I don’t think I’ll get home until dinner time, so I won’t have those 40 min to roast the garlic. Do you think it’d work well without roasting the garlic, by either tossing it with some olive oil and cooking it in a pan or simply adding garlic powder instead? Thanks for sharing! You could do either! I’ve also had success as thinly slicing the garlic and roasting in along side the broccoli. This recipe was absolutely delicious! Thanks!